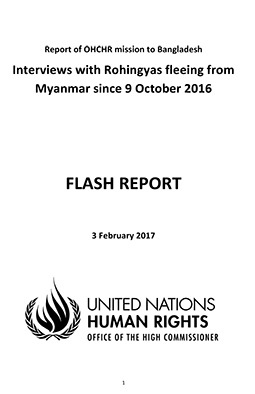 The UN Special Rapporteur on human rights in Myanmar, Ms Yanghee Lee, announced in the UNHRC at Geneva on 13 March that the Burmese state was involved in Crimes against Humanity directed towards the Rohingya people. The rapporteur has further said that the institutional persecution “indicates the government may be trying to expel the Rohingya population from the country altogether” and she demanded an international level probe. Nobel peace prize winner Aung San Sung Kyi, who is the de facto leader of Myanmar government has refuted the UN report, and announced that an internal investigation is suffice to look into allegations. The USA, the EU and the UK have avoided taking a stand on the investigations and are apparently backing Myanmar to evade international pressure due to their geopolitical interests. The UK’s envoy to the UNHRC, Julian Braithwaite, said that the international community needed to engage with the Myanmar State “without damaging the delicate civilian-military balance”. The British response is somewhat similar to the British role played in the case of Eezham Tamils. On 05 February 2009, when the war was heading towards genocidal end in Vanni, Sir John Sawer, the representative of the UK to the UN Security Council (who later became the chief of MI6, Britain’s external intelligence agency), went on record stating that the Tamil Tigers were long blighting the government of Sri Lanka. “We want these to be brought to an end,” John Sawer said at that time. In Myanmar, the US-bandwagon is continuously pursuing its agenda of strengthening economic, military and geo-political ties with the ‘reformed’ Burmese State. Many western diplomats, stating that she is constrained by the remnants of the military junta, and its hold over the civilian administration, defend Aung San Sung Kyi stand. Such excuses reminds Eezham Tamils of the western rhetoric of how ‘liberal’ Sinhala politicians in Colombo are being constrained by the Sinhala Buddhist extremists, commented Tamil activists in Jaffna. Reports on the recent phase of systematic persecution of the Rohingya emerged during 2012, when Burmese military and police and Bamar and Arakanese mobs alongside the Buddhist monks were behind the ethnic cleansing of Rohingya inhabited settlements throughout Arakan state and in the central littoral parts of the country. The systematically intensifying violence against the Rohingya of Burma triggered an exodus of refugees numbering over 65,000 according to the UN estimate, to neighbouring countries. More than one third of them have fled since October 2016, following the recent military and security forces’ operations conducted by the Burmese government in Rakhine state systematically targeting Rohingya villages and settlements. The recent upsurge in government violence is characterised by counter-insurgency strategies and follows what the government says is Rohingya militant attacks on border-patrols along the Rakhine and Bangaldeshi border. Aung San Sung Kyi, defends Burmese military operations against Rohingya villages stating it was triggered by militant attacks, and decries international criticism against the Burmese government and military. Yet the fleeing Rohingyas are not desired even among neighbours, such experiences of genocide and abandonment is well understood by the Eezham Tamil nation as well. In Bangladesh to which a majority of Rohnigya have fled due to its cultural and geographical proximity, they are hoarded into internment camps. 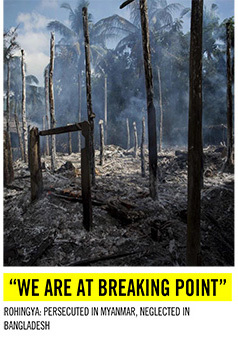 Wherever the Rohingya have set up their make-shift camps, Bangladeshi authorities have responded by demolishing them, and deploying increasing coast and border guarding operations to prevent the further arrival of Rohingya refugees fleeing genocidal violence. There have also been several incidents of refugees being sent back. On 11 January, Bangladeshi Prime minister Sheikh Hasina is reported to have officially requested the government of Burma to take back tens of thousands of Rohingya refugees. In December 2016, according to Mizzima News, the foreign minister of Bangladesh in communique with Burmese officials expressed that his government wishes to deport over 300 000 Rohingya from Bangladesh, who he allege have been there illegally for years. The Rohingya people has had a historical presence in the region, yet the Burmese State and Buddhist Burmese nationalists refute this as well as the national character of the Rohhingya by denying them both citizen rights and recognition as an ethnicity indigenous to the land. Subsequently they are denied what is their entitlement to exercise collective political rights and self-determination in their historic territory of habitation. The Rohingya are framed and subsequently delegitimized as Bangladeshis and immigrants, and posited as external to the country. Similarly such a discourse reflects the Bamar chauvinist nature of Burmese nationalism, which was evident also with the post-independence ‘Bumiputra’ movements of the Buddhist chauvinists who forcefully uprooted hundred thousands of Tamils in Burma in the 1950s by framing them as illegal immigrants and as implanted by the British from India. The efforts coordinated by the Burmese state to ensure such an exodus utterly denied the historic presence of maritime and mercantile Tamil communities in Burma in historical past. The modern Burmese State is constituted by a coalition of Buddhist ethnic groups, but is dominated by the Bamar, and has ever since its independence been fashioned in the image of a Theravada Buddhist military State. The intricate connection between the modern state with Theravada Buddhism and nationalism is comparative to the development of the Sinhala Buddhist character of the imperialist implanted unitary state of Ceylon, which later renamed itself to Sri Lanka. What is equally striking is the geo-political matrix within which Burma and the Rohingya question is embroiled, and reflects the designs and modus operandi of powers in the Indian Ocean region and in South Asia. Aung San Suu Kyi, who was awarded the 1991 Nobel Peace prize and whom the USA has promoted as a champion of democracy and freedom and her party the National League for Democracy (NLD) have since their electoral victory in November 2015, been an integral component of the new government. The USA and its allies have been normalizing State-to-State relations and are cultivating new ties with the new government. The US rapprochement and normalization of diplomatic ties with Burma has hastened throughout 2016 and was given a decisive shove with the November 2015 election of Aung Sui Kyi and her party into a coalition government with political representatives of the military junta. The strategic interests on part of the US Establishment are also evident in the recent lifting of long standing sanctions against the Burmese state by the Obama administration. However, the US engagement is not based on humanitarian orientations as evident in the US trajectory of intervention in the region. It is rather of imperialist, corporate and of strategic geo-political and geo-economics interests. Burma’s strategic position between South Asia and South–East Asia is well known and there is a Western component in countering Chinese influence in the region and tilting the Burmese state towards the US bandwagon through offering a free market economy. 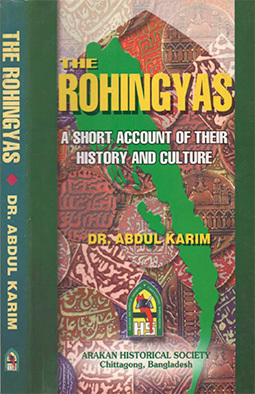 The territories wherein the Rohingyas are settled also roughly correspond with the Isthmus of Kra, a perennially strategic point in controlling trade and movement across the Bay of Bengal and the South-China Sea. The Rohingya territory is also eyed by imperialist interests for its canal potentialities in a similar fashion as occurred in Mesoamerica where the Isthmus of Panama after initial French attempts was brought under the possession of the USA and subsequently the Panama Canal was built and controlled by the USA from the early years of the 20th century till date. A dimension to the re-alignment strategies of the USA towards the Burmese State is to secure geo-political and economic interests, without contradicting the Burmese ruling elites and government established patterns of national oppression and structural genocide against non-Buddhist nations and people. Such patterns of oppression and land dispossession can also be argued serve MNCs and US aligned geo-economic interests opting to secure free economic zones, trade and manufacturing benefits, and preferential access to natural and human resources and strategic territories in order to secure a process of exploitative extraction. The US efforts in approaching Burma have hence tilted the Burmese State towards free market economy and US orientation, liberal ideology, liberalisation of media etc. but this has not implied any re-configuration of State power or any democratic facilitation of the inalienable rights of oppressed nation, and peoples in Burma. It has rather lead to the resoluteness of the ruling elites of Burma in finding military solutions or other enforced solutions to the national questions rampant in several parts of Burma. It was evident when the Burmese state broke a 17-year cease-fire agreement with the Kachin Independence Army (KIA) in 2012 and began an extensive military campaign to destroy the movement and occupy the Kachin territory. There were reports of this being coordinated with foreign investment projects aimed at exploitation of natural resources. Mainly it was reported to be Chinese and MNC interests in utilizing hydro-electric potentialities in the Irrawaddy delta region. Rohingya activists have pointed out that the recent military campaigns aimed at ethnically cleansing territories for Rohingya settlements are similarly aligned with the interests of pursuing a military solution to the Rohingya question as well as to clear the land for corporate exploitation of natural resources. It is in the backdrop of such international dynamics that the State apparatuses of the Burmese state have systematically escalated their persecution and atrocities against the Rohingya people. There are important lessons to take from this, as international endorsement of and interaction with an oppressive or genocidal State serves only to embolden the State and its political elites. Furthermore, Aung Sui Kyi and the Burmese government deny any allegation of genocide and atrocities against the Rohingya and brand such allegations as propaganda. This is reminiscent of the modus operandi of genocidal State of Sri Lanka talking of ‘development’ with its global actors in the occupied country of Eezham Tamils. The Burmese governmental legitimization of the coordinated set of actions aiming to debase, de-territorialize, and annihilate the national existence of the Rohingya also bears similarities with Colombo defending its genocidal war in 2009 by cloaking its genocidal nature and intent with narratives of it being the ‘greatest humanitarian rescue mission’ and as a ‘war against terrorism’. 13.05.17 US Bandwagon gets further exposed on Myanmar align..
09.02.17 UN still failing on paradigm-setting ‘Sri Lanka’ r..
28.11.16 Impunity shown on genocidal Sri Lanka emboldens My..